In the 2004 election, according to exit polls, 78 percent of white evangelicals voted for George W. Bush. The president's deft use of religious language, socially conservative policy positions and unprecedented outreach program had galvanized highly religious voters, and there was serious talk of a permanent Republican majority built on their support. The Democratic Party, meanwhile, had been represented by John Kerry, whose campaign was dogged by the perception that it did not take faith outreach seriously and who struggled to convince voters that his religious rhetoric was genuine. Four years later, the script hasn't exactly flipped. But the shift when it comes to religious rhetoric has been remarkable. In the 2008 election cycle, it is the Democrats, not the Republicans, who seem most comfortable discussing their faith - and reaching out to the faithful. Consider the frontrunners for the Democratic nomination. Sen. Barack Obama has touted his "personal relationship with Jesus Christ," and said he is "confident that we can create a kingdom right here on Earth." He has organized "faith forums," says he seeks to be an "instrument of God," and speaks of his religious conversion following community organizing in Chicago-area churches. Along with conservative Sen. Sam Brownback, he spoke about fighting AIDS at evangelical pastor Rick Warren's Saddleback Church in California. And an Obama "gospel tour" in South Carolina, though not without controversy, drew thousands of black evangelicals over the weekend. Sen. Hillary Clinton, meanwhile, has been less outspoken than Obama about her Methodist faith - which is perhaps why, among the frontrunners, she is seen as the least religious, according to a recent Pew survey. But behind the scenes, Clinton, who is thought to be deeply religious by those who know her, has been engaged in an impressive outreach program to win over religious voters. Last year, Clinton hired Burns Strider, a highly-regarded white evangelical born and raised in Mississippi, to be her faith outreach director. She and Strider, who headed up the Democrats' outreach program following the 2004 election, are casting Clinton's faith as integral to her life and her policy positions on issues like genocide in Darfur. It's a strategy made more viable by the rise of pastors like Warren and Bill Hybels, who talk more about issues like poverty than the battles of the culture war. Clinton has also done significant outreach among Iowa's relatively large Methodist community, according to Dan Gilgoff, politics editor at Beliefnet.com. "She doesn't talk about it as blatantly, but her campaign reveals a very robust and sophisticated effort," says Gilgoff. John Edwards, a Southern Baptist-turned-United Methodist, had a high-profile stumble with religious voters when two of his bloggers were discovered to have made comments before they joined his campaign that Catholics found offensive. But his populist message dovetails nicely with the new evangelicalism of Warren and Hybels - Edwards casts fighting poverty as a moral issue - and he has spoken eloquently of finding his faith following the death of his son in 1996. 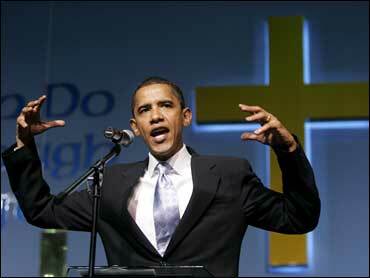 He has also been reaching out to progressive religious leaders. The Republican frontrunners, meanwhile, have struggled to win over deeply religious voters looking for a candidate to rally around. Rudy Giuliani, the former New York City mayor, has socially moderate positions on issues such as gay rights and abortion that are anathema to traditional evangelicals, as well as a personal history that doesn't play well with the group. A Roman Catholic, Giuliani says his personal religious beliefs are private and generally declines to discuss them, though he often invokes God on the campaign trail. In March, Richard Land of the Southern Baptist Convention criticized Giuliani for how he handled his divorce from his second wife. "I mean, this is divorce on steroids," Land told the Associated Press. "To publicly humiliate your wife in that way, and your children. That's rough. I think that's going to be an awfully hard sell, even if he weren't pro-choice and pro-gun control." Late last month, a group of prominent Christian conservatives threatened to back a third-party candidate if Giuliani becomes the Republican nominee. Giuliani's rival Mitt Romney, the former Massachusetts governor, has spotlighted his family and traditional values over the course of his campaign, presumably to draw a contrast with Giuliani. But the nature of his faith - Romney is Mormon - appears to be a significant problem for many religious voters. A September Pew poll found that just 46 percent of white evangelical Protestants have a favorable opinion of Mormons, while 39 percent have an unfavorable opinion. A Rasmussen Reports poll last year found that more than half of evangelical Christians wouldn't cast their vote for a Mormon. Romney has made some inroads. This month he secured the endorsements of Bob Jones III and Robert Taylor of South Carolina's Bob Jones University, a conservative Christian college that teaches that Mormonism is a cult. He also won a recent straw poll among socially conservative "Values Voters" in Washington. But Romney, who until relatively recently supported abortion rights, remains a hard sell for many evangelicals. Former Sen. Fred Thompson, by contrast, looked like he might be someone they could rally around. The actor's manner has drawn comparisons to conservative icon Ronald Reagan, and earlier this year it seemed like he might have the policy positions to match. But a steady stream of revelations has dampened some evangelicals' enthusiasm. Thompson has said he is not a regular churchgoer, and he won't talk about his faith. He reportedly lobbied the first Bush administration on behalf of a family-planning group to ease an abortion restriction. And he refuses to back a constitutional amendment banning gay marriage. In March, Focus on the Family founder James Dobson said of Thompson, "I don't think he's a Christian." Thompson has not necessarily lost religious voters: Christian conservative activist Gary Bauer backs him, and a CBS News poll this month found that more white evangelical Republican primary voters support the "Law And Order" star than any other candidate. But Thompson has failed to coalesce the support of religious Christians the way his campaign had hoped. "He has no passion, no zeal, and no apparent 'want to,'" Dobson wrote in a leaked email to supporters. "And yet he is apparently the Great Hope that burns in the breasts of many conservative Christians? Well, not for me, my brothers. Not for me!" And then there's Sen. John McCain, who long identified as an Episcopalian but now calls himself a Baptist, and who has struggled to strike the right note with religious voters. McCain helped draft the McCain-Feingold campaign finance reform bill, which Christian broadcasters say hampers their free speech, and famously dubbed religious right icons Pat Robertson and Jerry Falwell "agents of intolerance" when he ran for president eight years ago. He also opposes a federal marriage amendment and criticized Bob Jones University for its then-ban on interracial dating in 2000. McCain has tried to repair relationships with religious leaders, speaking at Falwell's Liberty University last year and hiring David Rexrode, the man who organized evangelicals for the 2004 Bush campaign. But his efforts at winning over religious voters have been clumsy - he recently said that he would prefer that a Christian president lead the United States - and they remain deeply skeptical of the Arizona senator. In the "Values Voters" straw poll, McCain finished in last place. Perhaps frustrated by the frontrunners, some evangelicals have begun rallying around former Arkansas Gov. Mike Huckabee, a Baptist minister whose articulation of socially conservative views has garnered strong reviews. But Huckabee's status as a dark horse candidate has, at least until recently, discouraged pragmatic evangelicals from supporting him for fear that his loss could result in their marginalization. Sen. Sam Brownback, who cast himself as the ideal choice of family-values focused conservative Christians, dropped out of the race Oct. 19. What's left is a presidential field in which Democrats may be poised to win over some of the religious voters who broke for Mr. Bush in 2004. Earlier this month, a CBS News poll found that while just 10 percent of white evangelicals feel that Republicans are talking about the issue most important to them, 24 percent feel Democrats are doing so. Forty percent of white evangelicals say they are less enthusiastic about voting this year than usual (only 16 percent are more enthusiastic), and more than half saying they wish there were more choices in the GOP field. "What is striking is that the tables are turned so dramatically since 2004," says Gilgoff. "The Republican ticket is pretty uncomfortable talking about their personal faith lives."